I'm a sucker for cute packaging so I ended up with these thing. These cute things are hand creams! I have no idea what they're called, but they're from Japan. I got these in Hong Kong for $55HKD for 30g and they sell for 12000won here. The fruit cap might look like it won't screw/stay on properly, but I've had it rolling around my purse without cracking open. I think the cream has a gel like consistency without being too runny. These aren't really worth it because there is so little hand cream so it's mainly for the cuteness. The things I like about these hand creams are the smell and how it makes my hands feel so soft! The pear cream smells like a juicy sweet pear. I haven't opened the apple one yet, but when I took a whiff of the sample, it smelled pretty good. These hand creams also come in orange scent in a cute orange container. Although they smell really good, I'm sad to report that the scents don't linger too long. The cream makes my hands feel very soft, but once I wash my hands, it doesn't feel as soft anymore. These are also available in lipbalms which are also packaged in the cute fruit shapes. You can get them on Sasa.com. Speaking of Sasa, has anyone noticed that Imomoko.com's layout looks awfully similar to Sasa's? I was a bored bored girl this week..4/5 days were spent hanging around the office with no classes to teach. Good thing I was allowed to leave after 3 hours on Weds-Friday XD Since I was so bored, I decided to open my DIY felt thingys. I made a bunch of cookies and a cake by using the patterns that were provided. I'm terrible at embroidery so up close, the stiches look really bad. I'm also not what I used to be at creating crafts, I think I'm too impatient for them now, but I still managed to get these made hehe. btw that apple one really smells good i think! Those are so cute! I'm a sucker for packaging, too. whenever i see the fruit creams i want to try it too! AWE! So cute stuffs! very prety cosmetic products! The first time I see it! Fruit smell + Kawaii packaging = lemming! Your creations are so adorable..you are very good at crafts, despite you protests! I hate being bored at work...on the other hand, I wish things would slow down sometimes for just a couple of days! the packaging is absolutely adorable. A lot of hand cream scents does not last long. 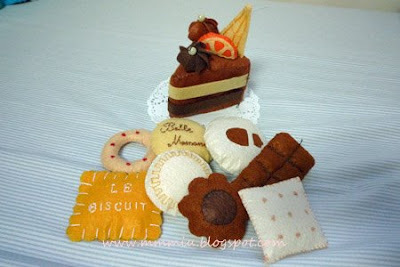 The stuffed cakes and cookies looks so yummy to eat. "I got these in Hong Kong for $55HKD for 30g and they sell for 12000won here"............miumiu, next time just translate them in one currency, i can't tell it's good price or not...haha, your embroideries are cute! They have those fruit creams here at my local japanese market, marukai - and I've always wanted to get them. and I've always wanted to try the cake felting projects, i see so many pattern books on ebay, but the translation is a pain. I would sooo buy those off you tho! homemade craft looks really cute!! ive seen those lipbalms around!! Ahh, I think I prefer using my hands to sew, I can't work the sewing machine for some reason! The tiny cake looks deli, mind keeping it out of my sight, I might chomp it hahaha. 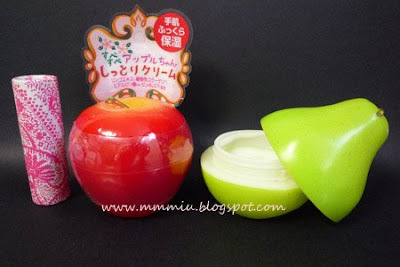 The hand creams are cute though, you can whip out an 'apple' and proceed to open it and apply your hand cream nonchalantly. Gimmicky but we like em! Ive always seen those fruit creams but I never got em since I didnt know if they were any good! thx for the review! so cute! all you beauty bloggers are just so crafty! What are you talking about?! Your cookies and cakes look amazing!!!! I hope you get some Sephora sales too!! Hahha awwww!~ Yeah, you need to leave the peel on for 5 minutes! Let me know if you want me to get it for you! those fruits look amazingggggg.. i would just buy it for the packaging and the smell xD haha. i love your embroidery.. cakes.. cookies.. yumm :) it looks fine from here! Yummmm and so cute looking too! I've seen those creams but of course they cost more here. They are small and cute though. and I'm so glad you did some DIY! They came out so cute! i always thought those fruit containers were very cute looking. but awkward to fit into your makeup bag heheh. my goodness... KT was right, u did an amazing job!!! how frackin cute man! we should have a blogger, crafter convention one of these days!!!! yeah imomoko does look like sasas! when I first went on that page i was like.."huh??" lol. Cute fruit hand creams hehe. i'm a sucker for packaging too. i'm going to look out for these fruits - they'll make really good gifts! those crafts look good enough to eat, you did good!